Tourism industry partners from across the state came together this week for the 44th Annual Arkansas Governor’s Conference on Tourism in West Memphis. 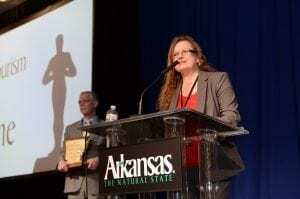 On Monday, March 12, 2018, Governor Asa Hutchinson inducted Batesville native Cathy Drew into the Arkansas Tourism Hall of Fame. Drew has been the executive director of the Ozark Gateway Tourist Council since 2000 and has been instrumental in development and promotion of tourism in the region. Drew is also the Chairperson of the Batesville Advertising and Promotions Commission. The Henry Awards took place on Tuesday, March 13, 2018. The Henry Awards honor individuals and organizations that have made important contributions to the state’s tourism industry in the preceding year. The Community Tourism Development Award was presented to the Batesville Area Chamber of Commerce, Main Street Batesville and the City of Batesville for their combined efforts to maximize the area’s potential. “While we feel the work has only just begun, we are honored to be recognized in front of our peers from across the state. We look forward to building off both the private and public accomplishments made in recent years to continue the drive of improving our community in every way” said Tourism Director Kyle Christopher.